1 Save up to 50% on ink—based on monthly subscription cost using only all pages in plan vs. cost per page of most color inkjet cartridge printers < $399. Share of New Inkjet Unit Shipments (< $399) for 2018Q1 period in the US from IDC 2018Q1 Final Release. Standard cartridge CPP from gap intelligence 7/24/18. 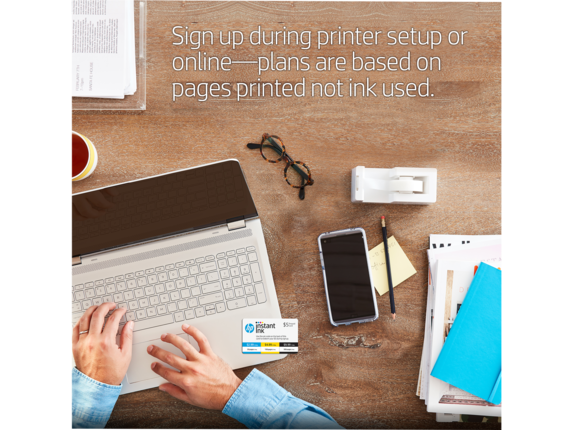 2 Get ink when you need it—based on plan usage, Internet connection to eligible HP printer, valid credit/debit card, email address, and delivery service in your geographic area. 3 Change or cancel your plan at any time online. If you decide to cancel your HP Instant Ink plan you can go back to using HP original Standard or XL cartridges. Plan upgrades are effective immediately and the charges will be applied retrospectively or in the next billing cycle, depending on user choice. Plan downgrades and cancellations are effective after the last day of the current billing period. For full details go to instantink.hpconnected.com/terms. 4 Rollover allows unused pages in a month to be placed in a rollover account and then applied to pages in excess of your monthly allowance. The rollover account balance is limited to a maximum or your monthly service plan pages (e.g: $2.99 50 pages = 50 page rollover maximum). 5 Valid only in U.S.A. If you want an easier way to keep yourself stocked with the ink that your printers need, our HP ink replacement service is just what you’re looking for. With plans that keep up with your demand, you’ll never be stuck without the supplies that keep your device going. Whether you’re running a business or simply printing documents and images from your home, you’ve probably spent more time than you’d like ordering printer ink replacement cartridges. It’s for that very reason we’ve designed HP Instant Ink. It’s an easy solution that makes sure you’re prepared for any printing job. When you’re running low, your printer will automatically order ink shipped directly to your door. Your service won’t begin, and you won’t be charged, until your Instant Ink cartridges are added to your printer. If you don’t already have a compatible device, we have the right machine regardless of your needs. If you choose one of our Instant Ink Eligible Printers, you'll have a high quality piece of equipment that’s ready for Instant Ink convenience. With HP ink replacement, you get exactly what you need for low cost while skipping the need for store checkout lines or searching for the correct cartridge online. At $2.99 per month for 50 pages, $4.99 a month for 100 pages, and $9.99 a month for 300 pages, you’ll have the right option to match your print volume and fit into your budget. If you choose the Instant Ink 100 page plan, you'll have the perfect choice for your moderate printing needs. And with savings of up to $204 a year, you’ll be getting major savings, too. Or if your office is printing a higher number of pages per month, our 300 page plan can save you up to $672 per year. With the cost of replacement printer ink, shipping, and cartridge recycling all combined into one low price, you won’t be caught off guard with unexpected bills. And with no annual fees, and the ability to update or cancel your plan online with a click of your mouse, you won’t be trapped in an agreement that isn’t right for you. We know you have better things to do than to constantly keep an eye on your ink supply. And when you choose one of our HP ink replacement options, you'll be happy that you won't have to worry about it ever again.